Due to popular demand, RE•WORK's Deep Learning Summit is returning to Canada. Last year, the event welcomed the pioneers of deep learning, Yoshua Bengio, Yann LeCun & Geoffrey Hinton, who shared their knowledge & expertise in a joint panel for the first time. Watch the discussion here. 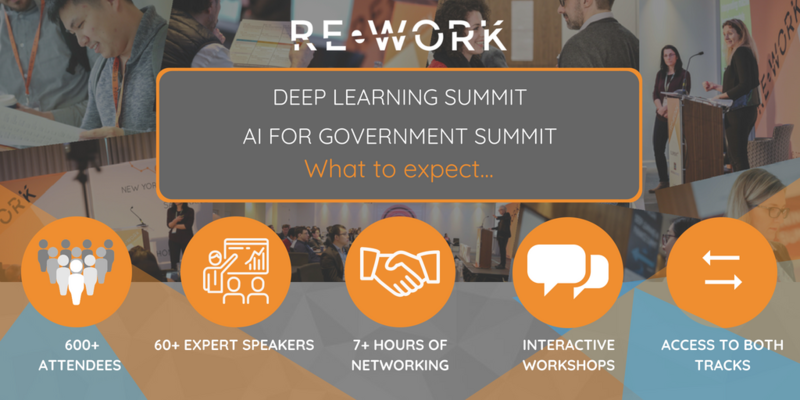 This year in Toronto will see the Deep Learning Summit joined by the first ever AI for Government Summit. Early Bird Discounted Passes are available when you register before August 31st. The Deep Learning track will cover the latest advancements in deep learning technologies from global leaders in the field and explore how industry leaders and startups alike are applying such techniques across industry and society. On the AI for Government track, there will be the unique opportunity to interact with Government Bodies, Policymakers, Strategists and Directors of Innovation to explore the use of machine learning to increase efficiency, reduce costs and meet the high demands of the public sector. Geoffrey designs machine learning algorithms. His aim is to discover a learning procedure that is efficient at finding complex structure in large, high-dimensional datasets and to show that this is how the brain learns to see. He was one of the researchers who introduced the back-propagation algorithm and the first to use backpropagation for learning word embeddings. His other contributions to neural network research include Boltzmann machines, distributed representations, time-delay neural nets, mixtures of experts, variational learning, products of experts and deep belief nets. His research group in Toronto made major breakthroughs in deep learning that have revolutionized speech recognition and object classification. Brendan is internationally recognized as a leader in machine learning and genome biology. His group has published over a dozen papers in Science, Nature and Cell, and their most recent work on using deep learning to identify protein-DNA interactions was highlighted on the front cover Nature Biotechnology. Frey is a Fellow of the Royal Society of Canada, a Fellow of the Institute for Electrical and Electronic Engineers, and a Fellow of the American Association for the Advancement of Science. He has consulted for several industrial research and development laboratories in Canada, the United States and England, and has served on the Technical Advisory Board of Microsoft Research. Most recently, Dr. Frey spun out a company called Deep Genomics. William Brendel is a Senior Research Scientist at Snap Research where he is tackling machine learning problems from Computer Vision to Natural Language Processing and creating new mathematical optimization frameworks, and tackling the challenging task of learning how to learn. With seven years of academic research and more than eight years of hands-on research, engineering, and program/product management experience at top companies in USA and Europe (Snapchat, Amazon/A9, Google) he is proficient in Machine Learning, Computer Vision and Mathematics. Currently 90% Scientist and 10% Program Manager, 200% Snapper. Passionate about science, cutting-edge real-time server-side and mobile technologies (including deep learning systems), and product design and management. Nina is a Computer Science Software R&D Advisor from the DOE Sandia National Laboratories, detailed as a contractor to JIDO for over ten years. Her multi-disciplinary research background covers applied agent-based and artificial intelligence in diverse domains such as distributed computing, enterprise systems, advanced analytics, frameworks for cognitive encapsulation, computational terrorist recruitment models, video processing, wireless smart sensor, and pervasive computing devices. She provides JIDO with technical guidance for selecting software analytics and architectures used to detect and understand the Counter Threat Network domains, by modeling disparate big data to extract, integrate, visualize, mine, and fuse. Tomi is co-founder and co-CEO of Layer 6 AI (layer6.ai) which was recently acquired by TD Bank, which offers the world’s most accurate prediction engine for enterprise data. Layer 6 AI was the first company to offer clients a prediction engine powered by a real-time deep learning framework. Layer 6 AI helps banks, media, cable/telco, and e-commerce companies leverage all of their data to predict customer needs and personalize each customer experience. Tomi is a serial tech entrepreneur with exits to Microsoft and Yahoo! The acquired software powers Azure’s cloud storage and the search ranking algorithm of Bing and Yahoo Web Search. While at Yahoo, Tomi built a novel $200M search advertising program, Paid Inclusion, and launched Yahoo! Answers. Tomi is also a founder of the Vector Institute for Artificial Intelligence and a founding Fellow of the Creative Destruction Lab, the world’s leading AI venture accelerator. Tomi holds an MSc in Computer Engineering and an MBA from the University of Toronto. Additionally, RE•WORK will be continuing the Women in AI Dinner Series in Toronto on October 23 with leading female minds from Uber ATG and TD Bank presenting. The evening aims to showcase diversity in AI and is open to attendees of all genders for a champagne reception, three-course meal, keynote presentations, and networking. Additional headline partners for the summit include Graphcore AI, Next AI, TD Bank, Algorithmia, Twenty Billion Neurons and CBC/Radio Canada who will all be sharing their expertise in the field, participating in workshops, discussions, presentations, demonstrations and exhibitions. Still not sure what to expect? Find out what you missed in Montreal in our event report with summit highlights, attendee and speaker feedback, an agenda overview, photos, videos, interviews and more.